David’s involvement with Texas A&M University began at the age of seventeen, when he first became a student of the proud university. Since then, his pride and admiration for Texas A&M has continued to this day, with contributions beyond measure. A proud moment for Myrtis Gallaway Eller. She views the portrait of her son, David Gallaway Eller, at the dedication of the David G. Eller Building. Portrait by Lajos Markos, 14 October 1989. 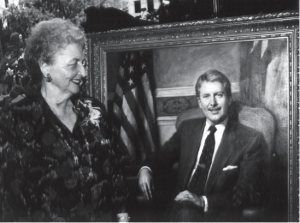 In 1983, David was appointed to the Board of Regents of the Texas A&M University System. In 1985, he was elected to serve a two-year term as chairman. He was the youngest Chairman of the Board of Regents Texas A&M has ever had. Expanded the programs of excellence for the development of Life Science and Biotechnology programs at Texas A&M University, as well as in various state agencies within the Texas A&M University System. Initiated major improvements within Texas A&M University’s services division, including the creation of the Institute of Biosciences and Technology in Houston’s Texas Medical Center for the purpose of interfacing the life science intellectual properties, which had been developed at Texas A&M University, with those in the medical institutions of the Texas Medical Center ¾ specifically the M.D. Anderson Cancer Center, the Baylor College of Medicine Molecular Biology Department and the National Children Nutrition Center. This interfacing was commissioned to both define and design the type of agriculture products that can be produced to inhibit cancer and improve nutrition. Created the Texas Institute of Oceanography in Galveston, the first joint venture which has ever occurred between Texas A&M University and the University of Texas, for the purpose of maximizing utilization of facilities, ocean going vessels and research in geophysics and oceanography. Initiated and completed the establishment of the University Research Park on the Texas A&M University campus for the purpose of promoting industry partners to foster the commercialization of intellectual properties which have been developed within the Texas A&M University System. 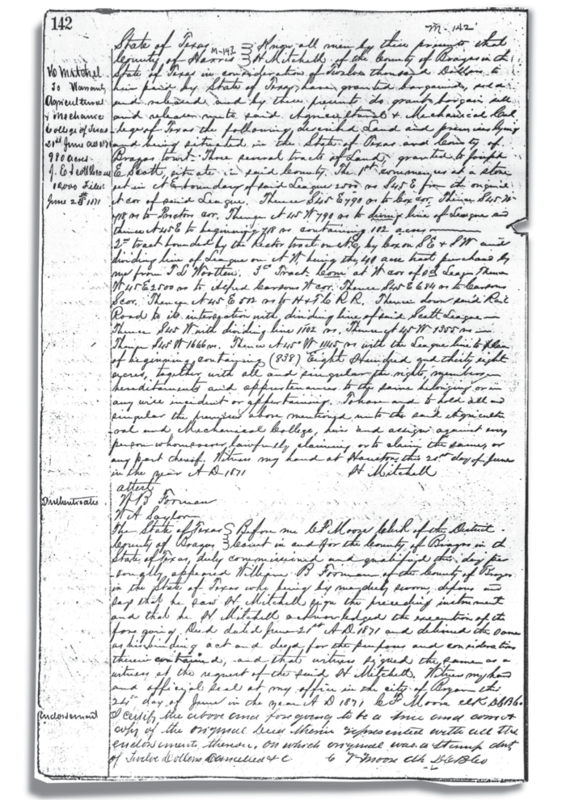 Originated proposals to state and federal entities to commercialize the intellectual properties which existed within the Texas A&M University System for new and ongoing research projects. These proposals resulted in securing research funds averaging over $400 million per year, thus ranking Texas A&M University among the nation’s top five research institutions at the time. 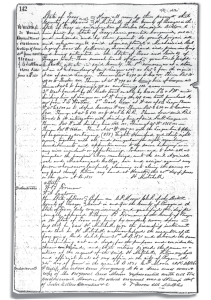 Initiated the first Texas A&M University capital campaign, a $600 million effort which, at the time, was the largest fund raising effort ever undertaken by any state university. Managed the issuance and sale of over $1.5 billion in bonds to refinance the total outstanding bond issues of Texas A&M University during a one-year period. This paved the way for significant capital improvement to the Texas A&M University campus and its support facilities, including the extension and improvement of the Easterwood airport runway facility for commercial aviation, as well as the initiation of a $50 million commitment titled, “Commitment to Texas,” for the purpose of establishing and funding the institute of BioScience & Technology in the Texas Medical Center in Houston. Designed and implemented a plan to improve the highway transportation system to and from College Station, personally presenting the plan to the board of directors of the Texas Department of Transportation in Austin. The plan (which was approved) was to secure $700 million, which was necessary to procure land right-of-ways for construction of a new four-lane highway system to connect University Boulevard (State Highway 60) at Easterwood Airport with the Texas A&M University Riverside Campus and State Highway 21. The plan also created access to the new commercial airport terminal facility (McKenzie Terminal) to handle the first commercial air traffic on the newly extended airport runway. Instituted novel fiscal and investment policies including a centralized cash management system that maximized yield on the $300 million daily balance of the Texas A&M University System, which significantly improved capital resource availability and planning. Developed and made the initial presentation, along with Michael T. Halbouty (class of 1930), to President George H. W. Bush to locate the George Bush Presidential Library at the Texas A&M University, College Station campus. Responsible for revising the academic base and strategic plan of Texas A&M University at Galveston to become a world-class center of maritime education and training for maritime captains, officers and crew of large ocean-going vessels. 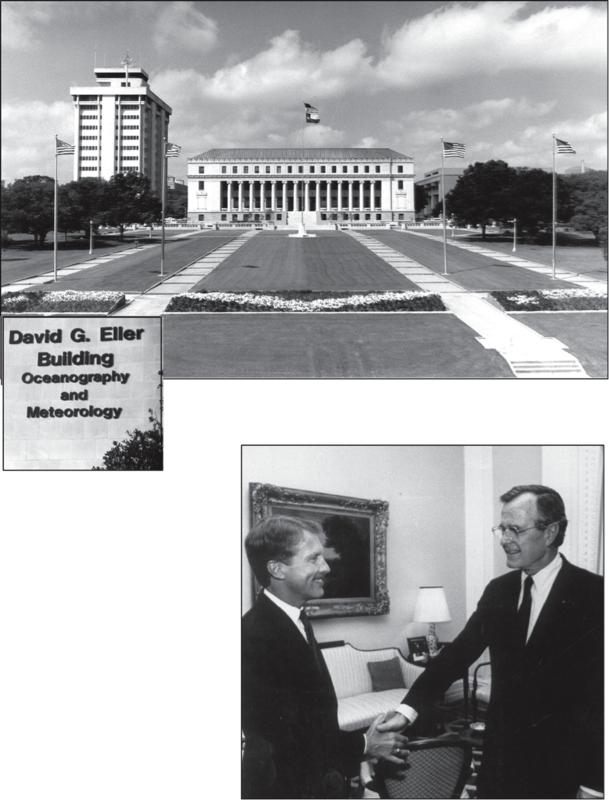 In November of 1988, the Board of Regents unanimously voted to name the Oceanography and Meteorology Building at Texas A&M University for David. The David G. Eller Building, at fifteen stories high, was the tallest building between Dallas and Houston. It was a fitting tribute to the man who gave so much of himself to the school he loves. David Eller receives congratulations at the dedication from President George Bush, 1989. Copyright © 2019 David G. Eller.